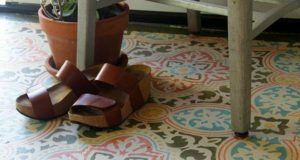 It’s been a long and colorful journey for my friend Maryam and her husband Chris to realize their vision for their “built from the ground up” boutique hotel, Peacock Pavilions, in an olive grove just outside of Marrakesh. A journey that has been well-told and documented on Maryam’s award winning blog, My Marrakesh. After meeting online, I’ve had the pleasure of collaborating with Chris and Maryam on multiple painting projects at Peacock Pavilions that have turned into leading American artisans on almost annual painting adventures to this lovely place. It’s been such a joy to see the transformation of PP from a muddy construction site to a beautiful oasis, and also to see Maryam’s transformation from a budding blogger with a dream to an accomplished photographer, international design star, Moroccan decorating expert, and now published author! Just last month, the family home at Peacock Pavilions was featured in none other than Elle Decor! 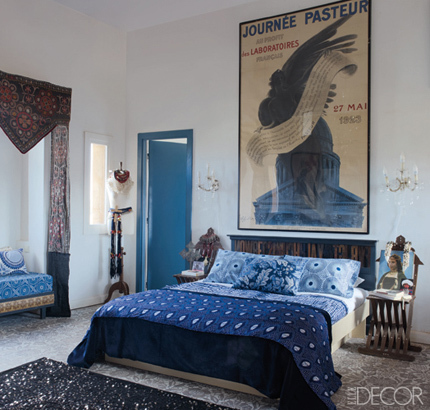 What a thrill to see the Art Deco mural I had designed for a guest room featured in all its full-page spendor! 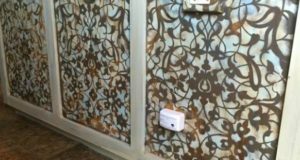 Not to mention, the master bedroom floor stenciled with lovely Skylar’s Lace! 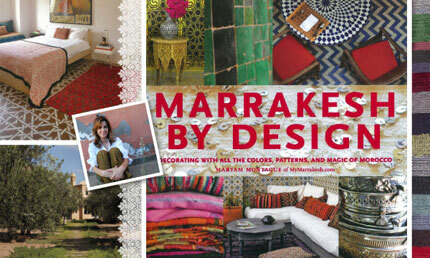 Now just this week, Marrakesh by Design, is hitting the bookstores and Maryam is on her official American Book Tour, which just so happens to be making a special stop at our San Diego Studio this coming Saturday May 12th!! 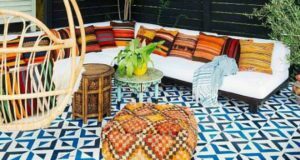 If you are in the Southern California area you won’t want to miss this Moroccan Decorating Event and book signing opportunity. Besides a design talk, we have some special treats planned, including a Peacock Feather stencil to take home, a Moroccan themed stencil project, a henna tattoo artist and other goodies. 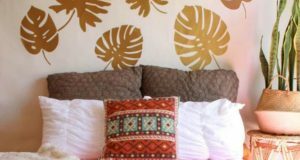 Please do check it out as we are looking forward to bringing a touch of Moroccan design and Maryam flair to San Diego! I am so excited for Maryam and for her book. 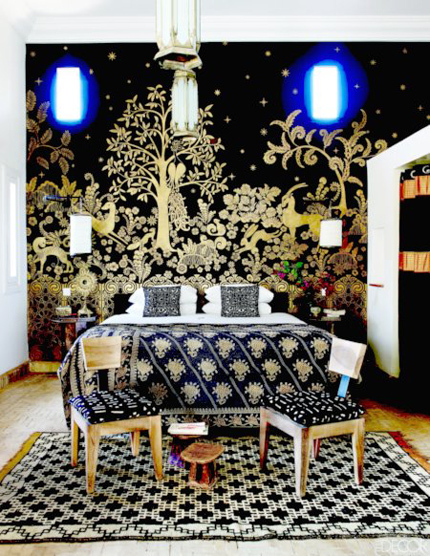 And that black and gold Rateau-inspired mural is my favorite of all the beautiful things you’ve ever done. It’s a pity you don’t have a donate button! I’d without a doubt donate to this fantastic blog!I suppose for now i’ll settle for book-marking and adding your RSS feed to my Google account.I look forward to new updates and will talk about this website with myFacebook group. Chat soon!